To spatchcock a chicken is to split it open, or butterfly it, by slicing out the backbone and smashing the bird flat. This allows you to grill over indirect heat in a covered grill without a lick of supervision. This recipe requires a larger-sized charcoal grill, such as a 22½-inch Weber, to adequately fit both chickens without having them overlap. I strongly encourage buying free-range chickens, which, as a whole, are far more flavorful and less fatty than industrially produced chickens. Combine the garlic, bay leaves, salt, and sugar in the workbowl of a food processor and process until finely ground. Transfer to a large bowl and add 3 quarts water; whisk until the salt mixture is dissolved. Strain the liquid into another large bowl, pressing on the solids to extract as much liquid as possible. Submerge the chickens in liquid and cover with plastic. Alternately, place each chicken in a large zip-lock bag, cover with half the brine, and seal. Refrigerate for at least 8 and up to 12 hours. Drain and rinse the chickens; pat dry with paper towels. Transfer to a baking sheet and coat the skin liberally with black pepper and paprika if using. Ignite 6 quarts of charcoal in a chimney starter and heat until the coals are covered with a layer of fine gray ash, about 15 minutes. Pour charcoal into pile onto one side of grill, cover with grill grate and allow to heat for 5 minutes. Scrape grate clean. 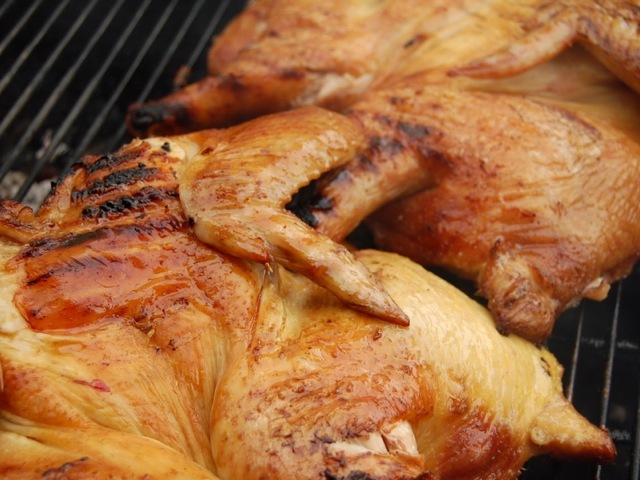 Spread the soaked wood chunks or chips over coals and place chickens skin-side down on the cooler side of the grill grate, breasts pointed away from the fire. Cover the grill with the lid and cook until the chicken is a deep golden brown and an instant-read thermometer inserted into the thickest part of the breast registers 165 degrees, 50 minutes to 80 minutes (timing accommodates varying chicken weights, variances in coal amounts, and air temperature). Transfer the chickens to a rimmed baking sheet and allow to cool at least 10 minutes before serving. Reserve any exuded juices to drizzle over meat or for future use. Though a butcher should be willing to remove the backbone for you, it’s quite easy to do yourself. Position the chicken — backbone side up — on a cutting board. Using a heavy-bladed chef’s knife or kitchen shears, cut along one side of the backbone as close as possible to prevent removing any meat. Repeat the process on the other side of the backbone, completely excising the backbone from the chicken. If you like, you can snip away any protruding ribs with shears. Flip the chicken over and, using firm but gentle pressure, press the chicken flat, breaking the breastbone. This will ensure that the chicken cooks evenly. I freeze the backbones for future use in stock and ragú. For more great tips, check out Matthew Card's feature on fresh summer cooking.